Knowing the facts on gastric bypass versus lapband can help you determine which type of obesity weight loss surgery is right for you. Having weight loss surgery requires a strong commitment to a new lifestyle once the procedure is over. But in order to have it done, you must meet certain qualifications. Surgeries are only performed on the morbidly obese or those who have major health complications. Before having the routines performed, you will be evaluated by a doctor, surgeon, and nutritionist to determine your qualifications. Because of the massive body morphing that occurs after surgery, a psychologist may be asked to evaluate your mental state. While both the gastric bypass and lapband system shrink your stomach by creating a smaller pouch for food to go into, there are major differences in how the procedure is performed. 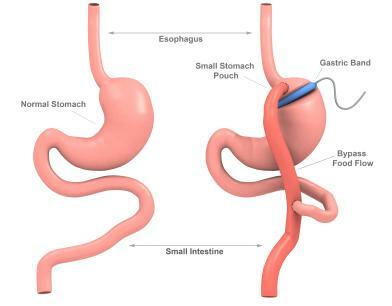 Gastric bypass involves taking a small portion at the top of your stomach and connecting it to the second part of your small intestine, bypassing the rest of your stomach and the first part of your small intestine. The rest of your stomach is then stapled. The gastric bypass can be done as an "open" surgery, where your abdomen is cut, or as a laparoscopic surgery, which involves a series of smaller incisions and a camera that is used to help surgeons perform the procedure. This procedure works for two reasons. One, it shrinks the size of your stomach, restricting the amount of food you eat. Secondly, the first part of the small intestine is bypassed, where a lot of calories are absorbed. For this reason, you may be asked to take vitamin and mineral supplements to avoid deficiencies. Risks of the surgery include death, blood clots, leakage from staples, pneumonia, or a narrowing of the opening between the stomach and small intestine. More common complications include vomiting, nausea, dehydration, ulcers, and intolerance to certain foods (such as fried). After the surgery, patients must learn to eat small amounts of food, because too much or too fast can cause pain or vomiting. "Dumping" syndrome is where nausea and vomiting, bloating, sweating, diarrhea and dizziness occur after the surgery. Patients are instructed to eat liquids, then purees, and move onto solid foods in a program their doctor designates. Rapid weight loss immediately following the surgery is common. Upwards of 50 percent or more of weight can be lost from this surgery. While some weight may be regained, a moderate diet and exercise program will help. Lapband surgery is less invasive than gastric bypass surgery. Instead of cutting the stomach and intestine, a small band is placed around the upper portion of the stomach. This is done by laparoscopic surgery. It limits the amount you can eat and the time it takes to digest. Unlike gastric bypass, which is both restrictive and malabsorbtive, the lapband is only restrictive. It makes a person feel fuller, faster. Because of this, the initial weight loss may not be as rapid, but will still result in significant weight changes over time. A small access band is beneath the abdominal skin. It allows the doctor to adjust the size of the band around your stomach by adding or removing a saline solution. As with any surgery, the lapband poses risks such as death or complications due to anesthesia. Other problems include nausea and vomiting, band slippage or erosion (correctable through surgery) or access port problems, which can also be corrected. The lapband surgery often requires a shorter hospital stay and recovery time, since nothing inside of you was cut or rearranged. The only cuts made were to gain access, not as part of the actual procedure. Leading a healthy lifestyle and maintaining a comfortable weight are both ultimate goals where it does not matter if you choose gastric bypass versus lapband. Both procedures will help you meet those goals if you follow up with your doctor regularly and make smart eating choices. Joining a gastric bypass surgery or lapband support group, whether in person or online, can help you deal with your changing body. Patients who have support are found to be more likely to lose the weight and keep it off. Having weight loss surgery does not give you an excuse to eat anything and everything. If you do not choose a healthy eating plan and have an active lifestyle, you may have poor health and possibly regain the weight.